This article contains facts and information about the life and times of the famous Native American Indian chief known as Blue Jacket. Who was Blue Jacket and why was this Native Indian chief famous? 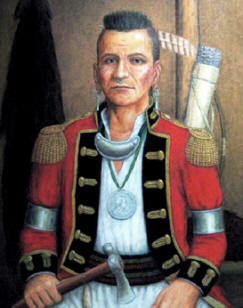 Summary: Blue Jacket (c1743 - c1810) was a famous war chief of the Shawnee Native Indian tribe. Prior to the War of Independence he led victorious battles against General Josiah Harmar and General Arthur St. Clair. He fought against the American colonists on the side of the British but was then forced to cede Ohio lands to the United States He joined the Western Confederacy in an attempt to regain Shawnee lands. He died in 1810. The following fact sheet contains interesting facts, background history and information about the life of Blue Jacket and the events in history that led to his fame as a great Native American Indian leader. European Allies and Wars: Fought with the British in the 1774 Lord Dunmore's War and in the War of Independence (1775 - 1783). Northwest Indian War (1785–1795) in Indiana and Ohio, also known as Little Turtle's war. Blue Jacket was a famous Shawnee war chief who opposed white encroachment and resisted against white expansion. Little is known about Blue Jacket's early life. He first appears in written historical records in 1773, when he was already a Shawnee war chief. Throughout Blue Jacket’s life with the Shawnee tribe, it is known that he fought under Little Turtle and they were at the forefront of the white resistance when colonists tried to expand their power as they started to settle in the Western part of Ohio. 1774: Lord Dumore's War. Americans defeated the Shawnee in the Battle of Point Pleasant, but Blue Jacket emerged as a strong Shawnee leader. 1785: The Northwest Indian War (1785–1795) aka as Little Turtle's war erupted. 1790: Conflict with General Josiah Harmar who attempted to subdue Native Indians in the Northwest Territory. General Harmar was defeated by a tribal coalition led by Little Turtle of the of the Miami tribe and Blue Jacket in an engagement known as "Harmar's defeat"
1811: Chief Tecumseh continued the Shawnee fight during Tecumseh's War in a final attempt to reclaim Shawnee lands in the Ohio Country. The speculation surrounding Blue Jacket is that he was in fact a white man called Marmaduke Van Swearingen, who was captured by the Shawnee Indians during the American Revolutionary War. However, this legend about Blue Jacket may have been put to rest using the latest in modern technology – DNA testing. The descendants of both Blue Jacket and Marmaduke Van Swearingen were tested and results concluded a mismatch of genes. So it would appear that Blue Jacket was a Native American Indian. For additional facts and information refer to the Wars with the Western Indians. Discover the vast selection of pictures on the subject of the tribes of Famous Native Americans such as Blue Jacket. The pictures show the clothing, war paint, weapons and decorations of various Native Indian tribes, such as the Shawnee tribe of Blue Jacket, that can be used as a really useful educational resource for kids and children of all ages studying famous Native Americans such as Blue Jacket. We hope you enjoy watching the video - just click and play - a great educational resource for kids.